Increasing the value of your home when selling can be a hard task, but a few improvements to your home can help make the process of selling your home easier all while staying within a reasonable budget. Updating worn, dated fixtures will bring new life into any space. Give your bathroom and kitchen an updated and fresh look! If new kitchen cabinets aren’t in the budget, new hardware is a simple way to update the entire look. Replacing an old or outdated toilet can make a huge impact on your bathroom, you can purchase a new one for just a few hundred dollars. Is your home still showing off the old-school aluminum blinds? New window coverings can really modernize a room. If your windows are standard width, you can buy basic wood blinds at Lowe’s or Home Depot, you can even customize the length! The front entry is the focal point of every home’s curb appeal. Give the exterior of your home a little face lift by either painting or staining the current front door or replace the door with something that will be appealing to buyer’s practical side. Don’t forget to replace / purchase the hardware! Heating your home accounts for more than 40% of its total energy usage, according to the U.S. Department of Energy. Programmable thermostats will allow you to customize a temperature profile throughout the day. With energy cost on the rise, many buyers will truly appreciate a feature such as this to help with long-term savings. 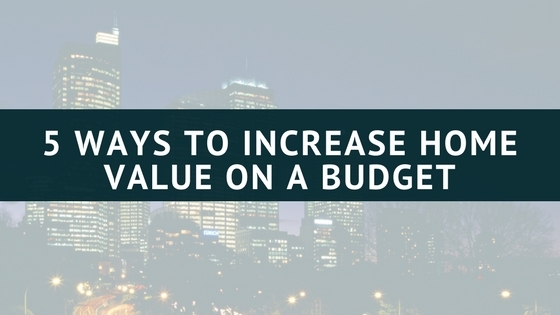 If you would like more tips on increasing your homes value contact me today!